Attention All ‘DADS’ of T.H.E. Students! ‘Dads and Kids’ Pizza Night Event! FREE Pizza, Drinks and Fun! On Monday, Sept 17th from 5:00 – 7:00 pm we will be having our 1st annual ‘Dads and Kids’ Pizza Night at our school. You will meet at the school cafeteria at 5:00 pm for FREE pizza and drinks. 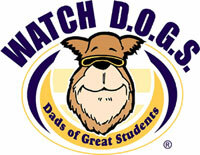 Around 6:00 pm we will have a presentation about our WATCH D.O.G.S.® (Dads Of Great Students) Program. WATCH D.O.G.S.® is an innovative program being used by schools across America which helps them to be positively impacted by the committed involvement of fathers and father-figures in their student’s life. Our goal is to have you spend at least one day this year at the school to be a positive male role model and to provide an extra set of eyes and ears. Dads, granddads, uncles, step-dads and adult brothers--this is your chance to have a night out alone with your student in a fun atmosphere at school. 1. Simply go to the Welcome Back page to register with our PTA and RSVP, or email watchdogs@tuscanyheightspta.org stating that you will attend the pizza night. We desire to have an accurate head count for food and drinks as a large turnout is expected. 2. Mark your calendars, and we’ll see you Monday, Sept 17th from 5:00 – 7:00 pm. If you are unable to attend--no problem! Email us at the address above and let us know you are interested.